The cone machine sitting in Building 25 on the campus of Clover Park Technical College serves as a perfect representative of 21st century mechatronic automation. The aluminum-built, 500-pound mechanism's function is simple: to efficiently insert small silver washers into larger blue cones. 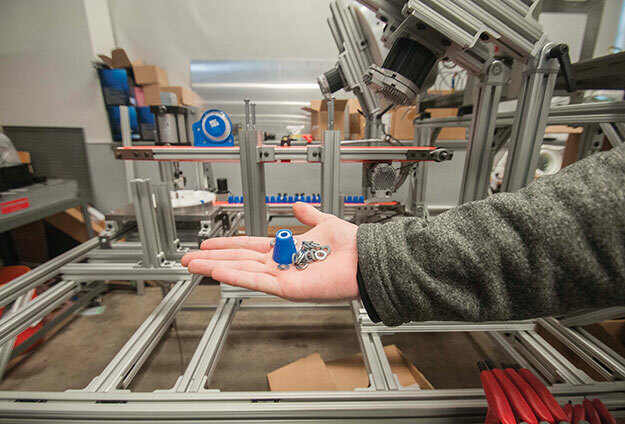 "Currently, the company that asked us to design and build this machine does the task by hand," explained Adam Yunker, a student in the college's Mechatronics Program. "This cone machine automates the process, and then the simple product it produces will be shipped for use across the country." Yunker and Tyrome Connor, a fellow student and Army veteran know this to be a fact; they both worked with two other students to build, wire and program the machine. "The instruction the instructors provide is great, and for those of us who like to work with our hands, this program is a great stepping stone into the future," Conner said. "And our portfolio of work done in this program is a big plus in getting hired." A rapidly growing career field, mechatronics is a multidisciplinary approach, which involves successfully understanding and using software, electrical and mechanical elements. Mechatronics originated in Japan in the late 1960s; since then it has become widely studied in Europe. "If your car was made after 2005, it is a mechatronic system," began Carl Wenngren, a former member of the Swedish Army and mechatronic instructor at CPTC. "In working with mechanics, electrical systems and software, a specialist is needed to navigate this junction to find solutions to problems." The interdisciplinary nature of Clover Park Technical College's School of Advanced Manufacturing program prepares students for roles as mechatronic technicians or engineers in a wide range of career fields to meet the needs of a rapidly changing 21st century economy. Since its inception in 2014, the two-year program has grown in such popularity that CPTC will soon complete construction of a new building to give the program three times more instruction space. "Through this educational process, we produce well-trained employees for a lot of industries," added Tom Chesnes, an instructor and Air Force veteran. "Mechatronics is very new to this country, and it represents a great opportunity for a lot of people, including veterans, to move into good paying jobs." The program offers graduates a choice of two degrees and three certificates. "Graduates on average earn $23 per hour and up after graduation, and goes up significantly with a few years of experience," added Jason Sawatzki, another instructor. According to Wenngren, about 35 percent of the program's students are veterans. "The discipline that veterans gain in the service prepares them well for our program," he explained. "Many of them are very good at working as a team in order to solve practical tasks, in working from theory to reality where failure is not an option." For more information about Clover Park Technical College's mechatronics program, visit: cptc.edu.